Saturday was the Buddy Walk and it couldn't have been better weather for it. I packed the sunscreen, extra juice and snacks and we waited outside for Rebecca to pick us up. While we were waiting, Kaityn played in the front yard and I noticed that her nose was running a little. Well, after that, it just got worse and worse. Her nose was running, her eyes were running and her face was getting swollen and red. 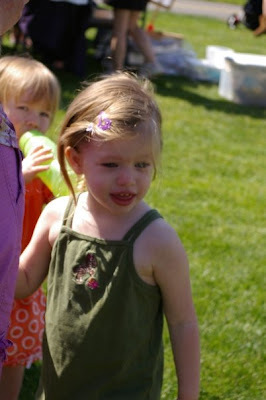 We started the Buddy Walk and after about 10 minutes she started crying and said she couldn't see. Poor thing was so swollen up and just miserable. I found a nearby walk-in clinic and the doctor said it was definitely an allergic reaction and we should try to pinpoint what - but that is near impossible. We gave her an antihistimine and she was doing better in about 1/2 an hour. Guess I'll be packing the antihistimine in her diaper bag from now on! Here's one picture as it was progressing. Today we are off to the waterslides. Looks like it will be a good day for it - lots of sunshine and maybe some clouds in the late afternoon. I'm sure Kaitlyn will have a blast!